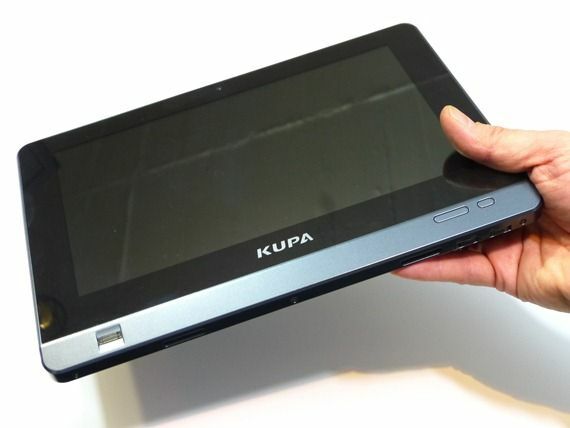 The Kupa X11 is a relatively niche Windows tablet PC based on what is the lowest-energy Windows-capable platform there is â€“ Intel Oaktrail, the Z670 CPU and GMA600 GPU. 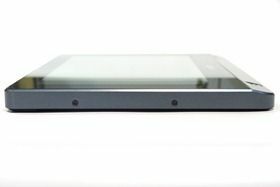 With it’s 1366×768 screen, SSD storage, 2Gb of RAM, fingerprint reader, active digitiser layer and fanless design, it stands alone in the market with, as far as I know, no comparison. The model we have here, the Kupa X11 Pro, even comes with 3G. To add to the list of positives, the Kupa X11 also has a huge internal battery that can run it for 10hrs. Just what sort of customer is the Kupa X11 aimed at and how does it perform? Let’s take a closer look. 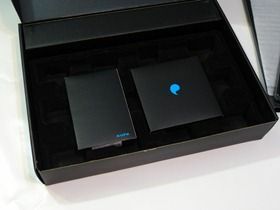 In the Kupa X11 unboxing video, we took you round the device and showed you the packaging and ports. The Kupa X11 itself doesn’t win any style awards as you unwrap it and it’s rather dense, despite only weighing 1KG. It’s nowhere near as thin as other 10 inch tablets but in comparison to other Windows tablets, it’s on par. Build materials seem strong and there’s no creaking or cracking. The Kupa X11 has a sold look and a solid feel â€“ good for the audience that we think will be interested in it. 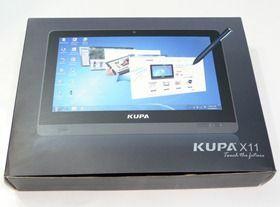 Top marks to Kupa for some high quality packaging and presentation. Full specifications and details are available here but here are the main points of interest. Weight: 1019gm / 35.9 oz. Ports: mini HDMI, 2x USB2.0, SIM card slot, headset port. At 1.019Kg (measured) the the Kupa X11 feels dense. It this was an 11.6 inch tablet it would feel lighter but the eye tells the head to expect a little less for this size device. 1KG isn’t ideal for any sort of long-term one-handed use (as is common with a tablet with a digitizer or capacitive input) so for those using it for more than 10-15 minutes in this mode we would recommend a case with a hand-strap across the back. In comparison with ‘consumer’ tablets it’s rather heavy. In comparison with other Windows tablets, it’s not bad at all, especially when you consider the battery life. More about that below. With only 64GB on board (128GB model available) it’s very surprising that there isn’t a removable storage slot. This is going to be a show-stopper for some as Windows 7 (and we assume Windows 8) disk usage will grow quickly. Maybe this reflects the target user. We discuss that below. 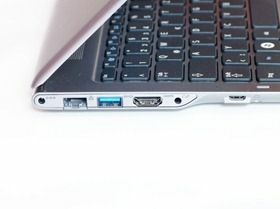 You’ve got 2 USB 2.0 ports which are useful for keyboard/mouse and an HDMI port for presentations and screens. A combo headset port isn’t perfect for the Skype headset scenario but acceptable considering the size of the Kupa X11. There’s no docking port. A 1366×768 10 inch screen is a real advantage on Windows. 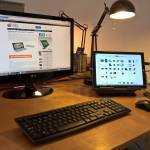 While fonts may appear small to some, they can be boosted across the board and for others, you have the advantage of being able to get lots of text, or a few windows, on the screen for multitasking. The brightness is impressive and the vertical viewing angles (in landscape mode) not bad at all. Horizontal viewing angles are not as good. This isn’t a wide-viewing-angle display but it’s better than some. The screen is glossy but matt display covers/filters are available and one was shipped with our review device. We didn’t have time to test it. Finger-driven Windows has never been the easiest of experiences. Kupa realise this and have increased the size of some of the windows elements to make it easier on the finger but there are still some issues. Closing a tab on Chrome was difficult, for example. Using the digitiser pen is a solution to this but not easy with one hand holding a 1KG tablet. We understand there are some use cases out there for digitisers but although a 10 inch tablet does increase the portability, it really reduces it’s usefulness for digitiser use cases and with the limited amount of CPU power on offer here, there’s again a mismatch. We are struggling to think of any users that would want such a low-power device with a pen when there are bigger (yet, more expensive) solutions out there. Pen responsiveness, fluidity and accuracy in handwriting mode (tested under Windows 8) was impressive for this left-handed writer. Before reading the rest of the review we suggest you check out this article where the Kupa X11 is used as a desktop office PC. The Kupa X11 is a low-power device in both senses of the expression. It uses little energy and can last for 8+ hours for basic usage but it’s also running one of the least powerful Windows-capable processors available. It means some things take longer. Some things take significantly longer! On the other hand, the Kupa X11 does a good job of some basic tasks. The 64GB SSD is not a screamer (or perhaps the platform is the bottleneck) but it does a reasonable job. Raw performance tests gave a max 138MB/s read speeds and 46MB/s write speed with small-block read/writes speeds (the important ones) at 9MB/s and 1.2MB/s respectively. This is echoed by good application start-up times when the device is idle. When the Kupa X11 starts getting busy, processes can get really laggy. We wouldn’t like to see a version of this with a spinning hard drive. Kupa have made a good decision to go with a relatively fast SSD. Boot time, thanks to the SSD, is fairly quick. Return from standby is a typical 5 seconds. Audio from the built in speakers is not high-quality and although the max volume seemed OK in our quiet testing environment, it’s not loud. If you’re thinking of puttinh the Kupa X11 in a noisy environment, and need audio, you may have an issue. We can not confirm that audio is passed through the HDMI port as this was only tested in Windows 8 Beta where we had audio issues. As video output is working in Windows 7, we assume audio is also working from the HDMI port. The audio through the headphone port was clean. I was really looking forward to having this run Windows 8. Will you do it? 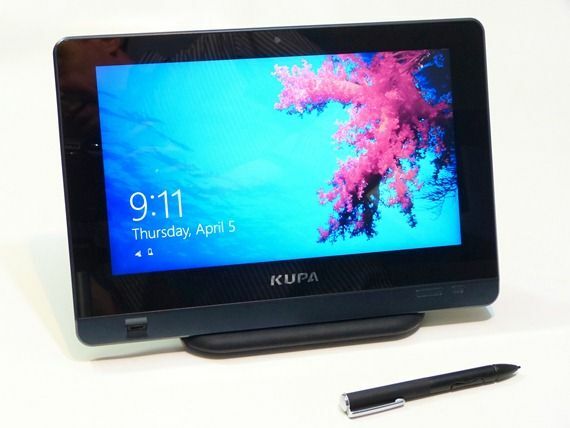 I have done some work with the Kupa X11/Windows8 and included some thoughts about it in the review but I won’t have time to do a video or full review of Windows 8 on the Kupa X11. What I will say is that a single core Atom was never that good at running Windows 7 desktop smoothly. We can’t expect Win 8 to be any better. Kupa have done a good job by providing a reasonable SSD and 2GB of RAM and the desktop experience is as good as is possible. As for Metro, I had some issues. It wasn’t smooth in this public beta with Windows 7 GPU drivers. That, I guess, is to be expected given the early peek we’re getting. Honestly, I find Metro apps to be a bit more reliable/usable than legacy Windows apps on the Kupa X11. I think that’s largely because Metro apps are run one (or maybe two) at a time, while you expect to be able to do more multitasking with a traditional Windows setup. When I tried to use the X11 for some basic work (writing blog posts in Google Chrome, editing photos), I found it frustratingly slow and gave up after an hour or two… but surfing the web in Internet Explorer 10 for Metro wasn’t bad. 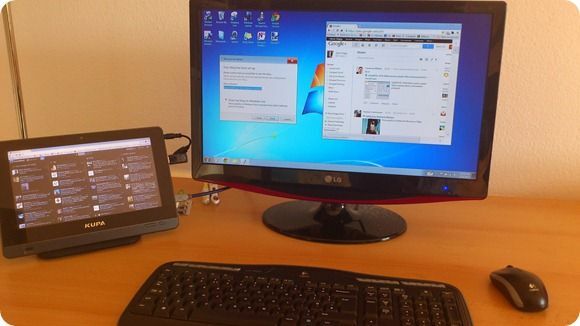 The Fujitsu Stylistic Q550 has been around for ages with virtually the same specification and is a fantastic Wintab. This would need to be significantly cheaper to get any traction. Cool looking. What is the battery life? Maybe you and I have a different machine though because mine definitely has a fan and is not silent. The user manual on Kupaworld still shows where the air intake and outakes are…. The machine isn’t noisy and you have to put your ear to the air exhaust to hear it, but it is not silent. In a normal office or home environment you can’t hear it but in a very quiet bedroom you might hear it. That beinf said, I’ve owned the X11 since it first came out in December 2011. It’s a great little machine and in my opinion is the first really usable Windows Tablet. First it has excellent battery life. I routinely get 7 to 10 hours depending on usage. Second, it has enough on-board SSD to be useful and has 2 USB ports, allowing me to use my 4G dongle at no additional cost and still have 1 port free for file transfers and such. 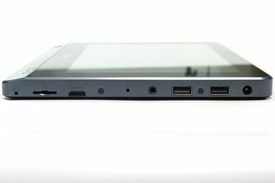 I pay for 1 4G dongle and can use it on many computers… A lot better than the integrated 3G other tablets offer. Last, it can run all Windows programs. No hunting around for an app that replicates what your other machines can do. I run a full version of Microsoft Office connecting to my company’s servers. And on the more important fun/hobby side, run a ton of Windows only programs I would sorely miss on a non-Windows tablet. My usage is mostly consumption as opposed to creation. But there is some creation too, like short emails and I love writing on the screen in OneNote. I take all my notes (client meetings and such) using the digitizer pen and I love it. It means all my notes are easy to search and always with me. Consumption is mostly videos. With the right codec, the machine does 720p no problem. I don’t care about 1080p on a screen that size so I haven’t tried it. I put Win 8 Consumer Preview on it and it transformed the machine into 2 machines in my opinion: Using Metro is a lot closer to a non-Windows tablet experience. The touch screen is more responsive, but the apps so far are simplistic and I don’t like seeing one app at a time only on my screen. Then switching to the classic Desktop I am back to the normal Windows computer I am used to and can run full size Windows programs, not cut down versions. (Full size Opera browser for example, though Opera Mobile for Windows works really well on a Win tablet). I love how fast it switches in and out of Sleep mode. About 3 seconds. And it uses almost no juice to stay on sleep mode, so you can really extend the battery use. I fly a lot (as in “Up in the Air” a lot, but on long flights rather than short ones like the movie), and really appreciate being able to not worry about my battery when watching videos, reading pdf files or catching up with the office. On the downside, no doubt the processor is weak. That’s the price to pay for great battery life. But when you know the machine’s limitations I find it isn’t much of a problem. I didn’t get this machine for heavy gaming, video editing, photo retouching or the like. The touch screen is very accurate and using Windows with a touch screen and a digitizer works well. I’ve also made some adjustments to the windows settings to help with easier finger input. But overall I don’t like touching the screen with my fingers, mostly because I am anally retentive on keeping my screen clean and viewable and hate fingerprints all over it. Much prefer the digitizer. The software keyboard works fine, though I wouldn’t write a long email or book with it. I’ve got a really small bluetooth keyboard that fills the gap between short email and longer ones. The best part for me is that although the tablet is heavyish for a tablet this size, I can now leave my Vaio Z computer at home on short trips when I know I’m just going to be “in and out”. It’s a couple pounds saving, an easier bag to pack (less volume), faster airport security, and all around better. In conclusion it is undoubtedly an “early adopter” machine, but a great intro to what a Windows Tablet can do. I thought the price was good too, and as a bonus it meets Win8 Metro interface specs, so that will be another whole new side to the machine when there are sufficient apps for it. Thanks for this review. I’ve been eyeballing some tablets and this review puts the Kupua X11 in my list. 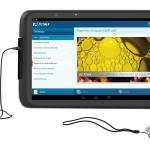 « Ultrabook Searches Rising as Netbook Searches Fall, Will Sales Follow These Trends?